Paul himself was a professional footballer in the 1980’s with Sporting Anderlecht and there is memorabilia on the walls in connection with football. The bar itself has a lovely atmosphere about the place and is very friendly and welcoming as are all the staff within it. They open everyday except Saturday from 10.30 serving breakfast, which start at 3 euros 50, and generally stay open until quite late in the evening. Bar snacks are available all day and a varied selection of sandwiches and toasties will not put a strain on your pocket at 2 euros 10. The well stocked bar boasts draught beers from Spain, Belgium and the UK and is very reasonably priced. Outside there is a huge sun terrace which is always very well utilised as they are only 50 metres from the beach and it catches the sun all day long. Although there is no entertainment as such they host Rim’s fun quiz on Wednesday and Sunday evenings starting at 21.45 which gets very busy. Next time you’re looking for somewhere to sit in the sun and have a beer and a sandwich, make your way to Popeye’s and see Paul & Dany they’ll be pleased to see you and they speak very good English. This week’s review highlights a bar which is predominantly Belgian but welcomes customers from all over Europe and certainly has that International feel to it. 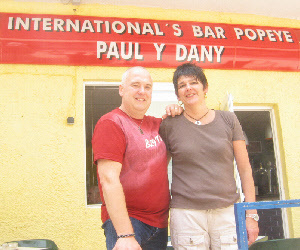 The proprietors, Paul and Dany hail from Brussels but moved to Benidorm back in 1995 and have had various bars and cafés before settling down at this very popular little outlet. This week’s chosen venue for Benidorm Focus is a bar which has only been open a short while but is attracting a lot of interest through its name. Situated on Avenida Del Periodista Escritor Emelio Romero (which must be the longest street name in history) nestling between Av Mediterraneo and Calle Gerona near the Hotel Diplomatic is the Speedway Bar. The owners Chris and Danielle from Leicester took over the bar in March 2008 and as you would expect based it on a theme of Speedway. The idea came from Chris who is an avid fan of the motor sport and as there is nowhere in Benidorm with a Speedway slant that’s what they decided upon. Already they have been approached by the Murcia Speedway Track to get an affiliation and maybe run outings there for locals and holiday makers alike. Memorabilia donated from riders and clubs adorn the walls and it is interesting to note that Glasgow Tigers use a picture of the bar on their programmes. Chris is no stranger to Benidorm as he has been visiting the Costa Blanca since 1986. In the UK, Chris was a DJ in many nightclubs across the East Midlands and also ran a successful mobile disco/roadshow together with shops in the Leicester area. Later this year a record is due to be released starring Chris alongside Bonnie from TV’s Big Brother fame under the name of Bonnie vs PDB Project. The bar itself is open daily from around 10am serving breakfasts, basket meals and snacks starting at 2.50 euros. The beer on sale is also reasonably priced and there are also 2 for 1 deals on local spirits. There are quiz evenings planned for later this month and every Monday you can enjoy live Speedway on TV as they show the British Elite Grand Prix season in addition to showing all major sporting events. 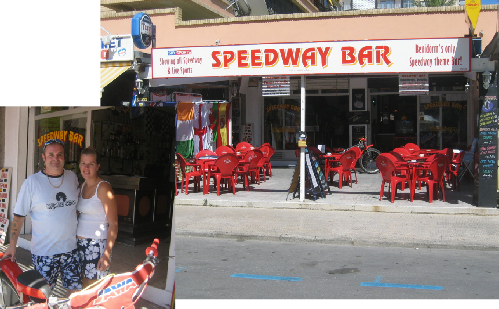 If you are into Speedway then I suggest you take a trip down to see Chris and Danielle, grab a bite to eat and a pint and soak up the atmosphere of Benidorm’s first Speedway themed bar. This week’s chosen venue for Benidorm Focus is a bar which has only been open a short while but is attracting a lot of interest through its name. Situated on Avenida Del Periodista Escritor Emelio Romero (which must be the longest street name in history) nestling between Av Mediterraneo and Calle Gerona near the Hotel Diplomatic is the Speedway Bar.